Yes, I am going to rant about the Caramel Macchiato Stout from FieldHouse Brewing Company. Sounding like something a very affluent European man would order after his morning jaunt around his estate, it couldn’t be anything farther from that. It is more reminiscent of a man with a huge beard, who also happens to be giggling while playing with a puppy. I digress though, FieldHouse is located in downtown Colorado Springs, it’s the first microbrewery to do so in over 21 years. With most of the bartenders sporting brodacious beards and jorts(Link Urban Dictionary), this place was super relaxed. With a massive garage door as the back wall, the atmosphere was like a cafe and auto-garage had a litter of beers. We got the same disillusioned look that we got at Triple S when we asked our bearded bartenders to try every beer they brewed in-house, but they were happy to oblige. Right outside the open back wall FieldHouse works with local food trucks to provide food, in our case we sampled some golden liquid mac n cheese that would have made Chester Cheetah drool. Being stuffed to the gills with mac n cheese and more than adequately satisfied with our beers we came to the conclusion that FieldHouse Brewing Company is one of the best places to go grab a beer and some food while you’re downtown. of honey with a citrusy taste. Delicious. nose, bread and slight citrus body, smooth finish with a touch of hop. balanced nose, very balanced body, with a slight hop finish. clove nose, peppery body, smooth finish. like fat tire had a micro brew baby. nose, crab apple body, tart finish. coffee ground nose, coffee liquor body, caramel latte finish. powerful. Bitter taste with some orange or lemon taste. clean bread nose, slight citrus, clean finish. 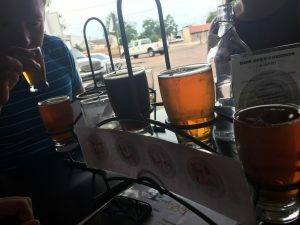 This entry was posted in Blog, Breweries, Community and tagged Beer, Brewery, colorado, colorado springs, Fieldhouse Brewing. Bookmark the permalink.